Registered students and their parents can view a list of books and materials in SIS as shown here. 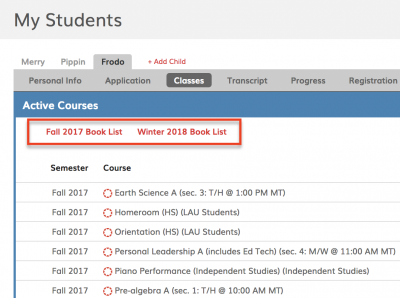 If your student is not yet registered you can view the books for a specific class by clicking on the Courses link above. Middle and High School Booklists are published each year on June 15th. To avoid issues, please do not purchase books for the upcoming school year until the updated booklist is published.